Our project is focused around the Tinka Orchard in Summerland, BC, and its relation to the Community Supported Agriculture (CSA) model. A CSA model is a system where farmers and shareholders (consumers) share the risk of food production equally. Based on this, we decided our research question would be: What are the components of the CSA model that are demonstrated by the Tinka Orchard? Our methods consisted of performing a qualitative case study using semi-structured interviews, observations, and on site experiences. Our results centered around understanding how a CSA model works in a real-life application. Our recommendations include lifting the water restrictions placed by the municipal government and connecting schools to the CSA model. Our main limitation to the study results from the fact that we were only on site for one day; this means that we were not able to observe the CSA for an entire season, limiting the aspects that we were able to experience first-hand. Al Tinka and Sana Kevei. There is no doubt that the aspect of ‘community’ plays a significant role in a working food system. Stemming from a wide range of academic backgrounds, our research team was interested in how the concept of community shapes our current food system and addresses some of the current issues pertaining to food security and food literacy. A food literate society is empowered with knowledge to make food choices and who understands how their food choices affect not only themselves but their environment and community as a whole (Wardle et al., 2000; Scialabba & Hattam, 2002). Our Community-Based Experiential Learning (CBEL) project was based around Al and Mary Tinka’s Community Supported Agriculture (CSA) Orchard. 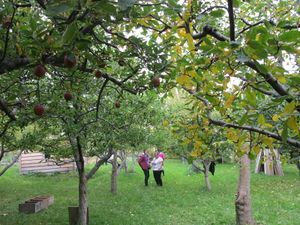 The Tinka Orchard, founded in 1975, promotes food security and food literacy in Summerland to just over 11,000 people. (BCstats, n.d.); it also does this to some communities in the lower mainland. With this in mind, our primary focus was to investigate: “what components of the CSA model are demonstrated by the Tinka Orchard?” Our research examined the educational properties that a CSA establishment can have on the community, such as connecting the shareholders to where their food comes from, who grows their food, and which farming methods are used to produce their food (Cone and Myhre, 2000). In this report, we will discuss our methods of research as well as our findings. A descriptive interpretation of our findings will also be addressed, as well as further suggestions for improving food literacy and food security. 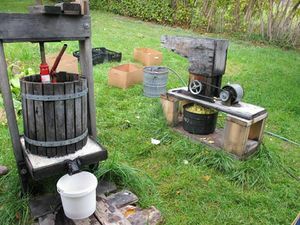 Al Tinka demonstrating how to make apple juice. Group members Ally and Kerlina showing us the apples they just picked. 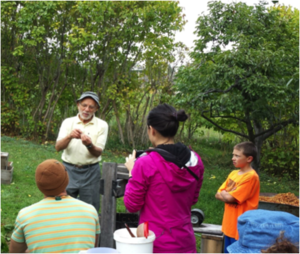 Al telling the group about the orchard. Our research was conducted using a qualitative case study approach to characterize the Tinka Orchard. This approach utilized all participants’ frames’ of reference, as well as the study of a range of phenomena such as feelings, thoughts and human and community interactions (Gerring, 2007). 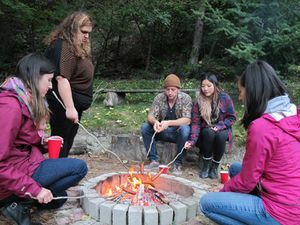 This allows the exploration of CSA through both environmental and community aspects. Chart 1:Outline of the multi-method strategy used to investigate, including source, structure of investigation and area of orchard examined. Tinka Orchard Wordpress: http://tinkaorchard.wordpress.com/ Website More in depth picture of how the orchard is run, this website is directed at investors and potential investors. Skype interview with Kristi Tatebe Notes from semi-structured interviews. Investor recruitment, promotions and organization behind Tinka CSA. Kristi finds the investors and signs them up and keeps them informed on how the growing season is going. Interview with investors at a food drop off Recorded semi-structured interviews. Investors perspective of the CSA model. 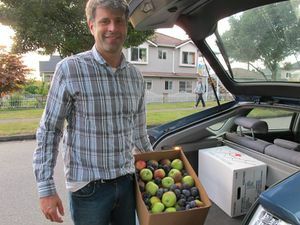 Environment Observation (Fruit Delivery, Vancouver) Pictures, and personal reflections Relations between Al and Mary and their investors/customers at the drop off. Interview with Al and Mary Tinka Recorded semi-structured interviews. Farmers perspective of the CSA model. Also how the orchard is ran and the process of growing, harvesting, packing and transporting fruit. Environment Observation (Tinka Orchard Operations) Pictures, videos and personal reflections. Farmers perspective of the CSA model. Also how the orchard is ran and the process of growing, harvesting, packing and transporting fruit. The original research proposal was based on using mixed methods and financial figures to show how adopting the CSA model had affected the financial security of the farm. After becoming more familiar with the Tinkas, we realized that our project was better suited to be an analysis of the Tinka Orchard and how it fits the characteristics of a CSA, rather than examining the differences prior to and after the CSA conversion. This allowed for a deeper focus on the CSA model and its direct relationship to the Tinka orchard. Communication between our research team and our community partners took place online. Extensive e-mails allowed us to convey our progress and ask questions for clarification and guidance. All of the data collected, using the methods expanded upon in Chart 1, was shared between ourselves using Dropbox and uploading files to our Facebook group. We managed the large amount of data collected by individually filtering our own photos/videos that were collected and only uploading relevant and usable data. Our ethical responsibilities to the Tinka family included being considerate of their time, respectful of their privacy, and being mindful of their level of comfort. We did this by ensuring we had their written and verbal approval after every major decision we made. 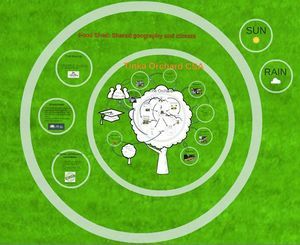 To get a better grasp of our project, we initially researched the Tinka Orchard website and Facebook page to gain an understanding of what their CSA model entailed and the details on how to become involved, e.g. shareholder pricing and varieties of fruits offered. In addition, the website contained regular updates of activities on the farm, as well as community-shared ideas and recipes for the fruit. Through a Skype interview with our community partner, Kristi Tatebe, we obtained a basic understanding of the Tinka orchard’s business model. Before using the CSA model, Tinka was operating at a loss each year. After converting to the CSA model, Tinka is now able to not only cover his water and farm expenses, but to also gain a substantial profit. Tinka maintains the orchard without the use of any sprays, pesticides, or herbicides. Although the orchard is not certified organic, Tinka essentially runs an organic farm by withholding the use of harmful, synthetic chemicals. Al Tinka demonstrating how to mow around trees to deter mice. Regarding the orchard’s advertisement and promotion, Tatebe stated that it is mainly done through word of mouth. Tinka’s website and Facebook page also serve as marketing platforms, sharing general updates and information about the orchard. Through marketing and customer feedback, the Tinka Orchard has been able to improve and make appropriate adjustments, such as a new light share option, which offers 75 pounds of fruit as opposed to the original 100 pounds. Fruits in the orchard garden. In Tinka orchard garden, Tinka hand-picks unhealthy and infected fruits from trees to minimize the spreading of diseases. In this way, Tinka reduces usage of organic pesticide. Those partially infected and small-sized fruits are used for juice-making. Non-reusable parts and pomace after juicing are collected by his neighbours for chicken feed or recycled by Tinka as compost. 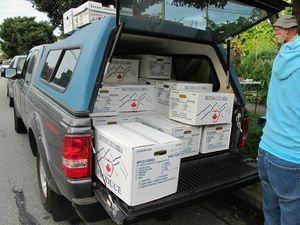 Paper boxes used for packaging are recycled during each fruit pick-up session. As fruits are perishable, different methods are shared in the CSA community to minimize waste of excessive fruits. Creative recipes and preservation methods such as, jamming, freezing and drying, are shared among members. Through the CSA operation, consumers in Vancouver have direct connection with farmers in Summerland. At the start of the season in May, Tinka collects funding from CSA members for farming inputs to the orchard. 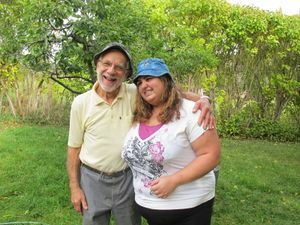 During the growing season, Al Tinka and his wife manage most of the work on the farm, although all CSA members have the option to work on the farm in exchange for fruit shares. Because the Tinkas deliver the fruits to the shareholders personally, they and the shareholders engage in meaningful personal interactions, thus solidifying their community bond. During the fruit-pickup, Al Tinka’s love for sharing farming stories can be seen, while Mary Tinka shares cooking recipes with others. Although the Tinka Orchard is successful in various ways, the orchard still faces challenges. Tinka explained that his property, which is composed of both his house and the orchard, are considered to be residential land instead of agricultural land. This is because the minimum land requirement to be considered agricultural land is 2 acres; Al Tinka owns 1.97 acres, which is just short of qualifying. As a result, Tinka pays considerably higher water bills because he is unable to receive an agricultural subsidy. This results in losses in efficiency and productivity, since a large amount of his resources are allotted to water irrigation of the orchard. In addition, Tinka explained the general challenges of maintaining a viable orchard farm. Prior to using the CSA model, Tinka was unable to cover the cost of expenses on the farm. 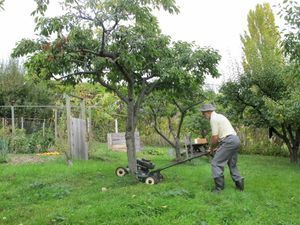 Because of his love for the orchard and maintaining an ecologically sustainable farm, Tinka continued farming on the orchard. After being introduced to the CSA model by a local fishery using the model, Tinka began to profit and cover expenses for the first time. At the same time, Tinka admits that without being retired and receiving government pension payments, the profits solely from the orchard would still not be enough to sustain the Tinkas year round. After studying the CSA model at the orchard, we were able to identify a significant, interdependent relationship between CSA consumers and farmers. Primarily, consumers and farmers share both the risks and rewards of farm productions. In return for their financial support for the farm, consumers who purchased shares receive fresh fruits. The farmer is then able to focus on production without additional efforts or stress required for marketing (Cooley and Lass, 1998). Moreover, farmers are able to focus on land stewardship while maintaining a productive farm (Cooley and Lass, 1998). This relationship as a result of CSA aids in sustaining the economic vitality of farms, having the potential to create effective contributions in revitalizing the agricultural sector (Cooley and Lass, 1998). CSA brings locally produced food to consumers. Purchasing local food reduces the food mile, increases fresh produce consumption and contributes to the local economy (McCullum et al., 2005). As a result, CSA helps construct an economically sustainable food system to achieve food security by increasing local food supply in the food system. With food waste as one of the major issues in the globe, CSA model demonstrates the production of healthy and local food in a sustainable way. Food wastes are minimized as the three “R”s concepts are upheld in the orchard by Tinka. 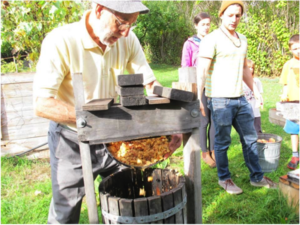 From a reduced use of pesticides to the reuse of packages and recycling of apple pressings as fertilizers, Tinka Orchard exemplifies maintenance of a farm in a sustainable way, as a result, approaching food sustainability. As far as building a sense of community, CSA model encourages face-to-face interactions and conversations through consistent fruit pick up days between farmer and consumers as well as within CSA members, hence, creating a community among them. Ultimately, achieving food literacy through communications as consumers understand more about the farm and knowing that by whom and where their fruits are grown. Other benefits of the CSA model include social benefits. As described above, the Tinkas as well as Tatebe make an effort to engage with their community by sharing recipes and stories with CSA members. Additionally, some members drive to Summerland to help farm and garden for a day with Al Tinka. Through these interactions, consumers and farmers gain a better understanding of each other’s circumstances, needs, and interests which thereby creates more integrated communities framed around food (Chen, 2013). In addition, CSA gives consumers “a feeling of supporting community local economy” (Chen, 2013). As a result, a greater sense of community is developed as a result of the Tinka Orchard. Although a deeper sense of community is not critical to achieving food security, it is an essential characteristic in improving other issues related to food security, such as food system education and food citizenship. Community gardening and urban agriculture have become increasingly important in developing alternative food networks which improves food access and encourages people to disconnect from the global corporate food system (Baker, 2014). The Tinka Orchard serves as an alternative food network to the global corporate food system in that the orchard provides fruit to local communities. Small scale agriculture also plays a significant role strengthening food system education by raising awareness of the origins of food and promoting the consumption of locally grown food (Baker, 2014). This has been exemplified by the Tinka Orchard in the way that Tinka invites neighbours and shareholders to visit and help at the farm. Community members then gain a better understanding of where their food originates from and thus leave the farm more educated about their food system. Small scale farming has also been illustrated as a method to encourage food citizenship, which is integral in shifting toward more sustainable food systems (Baker, 2014). Regarding the Tinka Orchard, shareholders are more exposed to the orchard, through updates of the farm on the website or visits to the orchard and thus gain a deeper connection to their food. Shareholders also gain a better understanding of the benefits of more ecologically sound food systems and are more likely to promote ecologically sustainable methods to others. 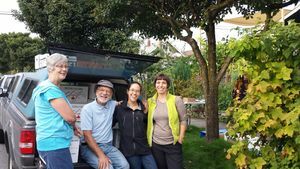 In this sense, the Tinka Orchards is a significant stakeholder in the Vancouver food system because it acts to encourage food security and related issues such as food citizenship and environmental awareness. It is important to address the challenges faced by Tinka in order to improve productivity on the farm. These challenges were largely due to a lack of water subsidies available for the orchard. If this issue is addressed however, there is more potential to improve food security. Subsidies, for water or for CSA farms in general, would encourage more farmers to participate. With increased availability of farms, food security as well as food citizenship could be increased. As well, there would be greater encouragement for participation in local food systems and community-building, which is essential in order to maintain a socially, financially, and ecologically sustainable food system in the future. 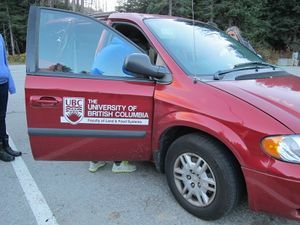 LFS Van used to for group transportation to and from Summerland, BC. Granted the short term nature of our project, there are inherent limitations to our findings and methods. We had limited time to develop relationships between our group and our community partner. Because we did not want to jeopardize our relationship, we strived not to inquire about sensitive or personal information. As a result, we did not gather substantial amounts of quantitative data, such as the numerical amount of profits achieved through the CSA model. In addition, our observations may be limited because we were only able to visit the orchard one time out of the growing season. This may result in inaccurate or narrow findings. 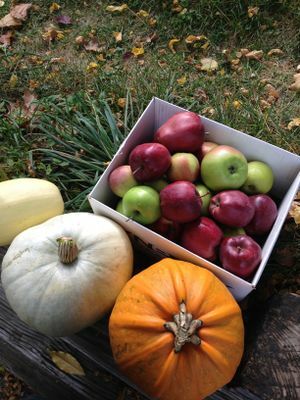 Apples and squash fresh from the Tinka's orchard and garden. 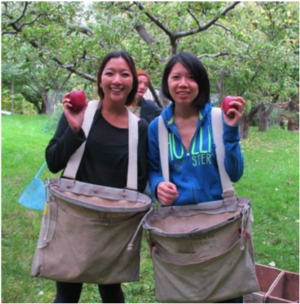 The Tinka Orchard plays a key role in strengthening and maintaining food security in both Summerland and Vancouver. The CSA model adopted by the orchard has proven to be a successful and sustainable method for both the farmers and consumers. However, we suggest that improvements in government policy that could further enhance the productivity of the orchard as well as food security in general. We would first recommend that government subsidies be given to CSA agribusinesses. This would give farmers greater incentive to farm and improve their efficiency using sustainable measures. A greater quantity and diversity in the CSA farms would enhance the availability of food and thereby improve food security. We also recommend changes in the water policy and taxing system. Currently, Al Tinka’s property is considered residential land rather than agricultural land. This has resulted in Tinka paying for extraordinarily high water taxes. Allowing the Tinka Orchard to be classified as agricultural land or providing water tax subsidies would greatly improve productivity and on the farm. As a result, this would enhance processes on the farm by allowing Tinka to use the resources saved from the water subsidies to invest on other processes on the farm. Ultimately, greater efficiency on the farm would result in improved food security. December 1, 2014, from JSTOR. BCStats. (n.d.). Municipal Census Populations (1921-2011). nomological validity.British Food Journal, 115(10), 1428-1453. Retrieved November 21, 2014, from ABI/INFORM Global. 20(1), 227-237. Retrieved November 20, 2014, from JSTOR. Scialabba, N., & Hattam, C. (n.d.). Organic Agriculture, Environment and Food Security. Retrieved from http://books.google.ca/books? This page was last edited on 10 December 2014, at 18:56.